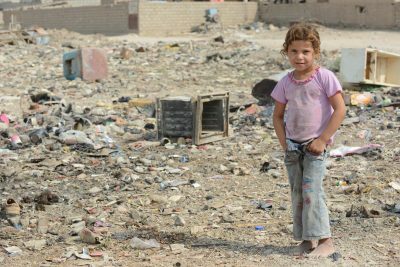 Human rights advocates and health officials estimate that 17,000 to 18,000 residents of Basra province have been poisoned by heavily polluted and salty drinking water. On Aug. 26, hundreds of residents stormed the Basra Health Directorate to protest the poor health services provided to those made ill, but relief is not in sight. Basra hospitals have been struggling since Aug. 12 to treat patients suffering from intestinal and skin diseases. Some hospitals have been so overwhelmed by the sheer number of patients and lack of medicines that were unable to provide assistance in thousands of cases. The number of people sickened continues to increase, with Abu Al-Khasib General Hospital alone receiving 400 patients a day. Statistics compiled by the provincial health directorate for Aug. 12-28 revealed close to 2,000 cases each day throughout the province. Those affected are presenting with colic, diarrhea and poisoning due to water contamination. In a video posted to YouTube on Aug. 23, a man in Basra can be heard laughing about the foul water running from a hose. The black liquid is obviously unsuitable for human consumption or use. “How can Iraqis survive when this is the water they drink?” one person says. Basra gets its water from the Shatt al-Arab, the waterway formed by the juncture of the Euphrates and Tigris. In an Aug. 28 statement, the High Commission for Human Rights said it has found high levels of salinity in the water feeding the Shatt al-Arab, a decline in water levels in the rivers feeding residential areas and an increase in chemical and biological contaminants in the Shatt al-Arab from sewage and industrial waste. The commission has also noted the lack of water treatment plants capable of helping resolve the problem. “Most of the small stations are not operational due to their low capacity and lack of maintenance,” the commission reported. Basra’s water has long been known to be high in salinity and heavily polluted. He offered no details, but his statement made it clear that whatever actions the government has in mind, they will not end Basra’s suffering anytime soon. There are apparently no emergency plans for responding effectively to such circumstances. On Aug. 17, activists from the province posted a video on YouTube of water from a residential water pipe containing unidentified insects. Some residents have also used their cell phones to record examples of polluted water. For the moment, bottled water appears to be the only truly safe drinking water in Basra, but even when it is available it is often unaffordable. Iraqi Health Minister Adila Hammoud has tried to downplay the severity of the situation, claiming that only 1,500 people have been affected, ignoring the much higher figures issued by the Basra Health Directorate and the High Commission for Human Rights. Education officials have voiced concerns about the possible spread of disease among students at the start of the new school year. Meanwhile, the widespread illness in Basra has led to a lull in one of the largest protest movements in Iraq in years over public services, but the dire situation might ultimately be the catalyst for mobilizing an even bigger movement. Featured image is from GuideStar.